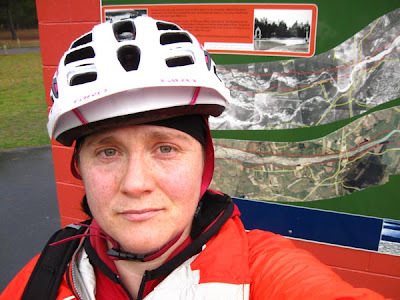 I would like to begin this post by reminding my lovely readers of this other post that I wrote less than a month ago in which I detailed my failed attempt to ride 12kms. That’s right, less than a month ago I couldn’t do a lap of Bottlelake without collapsing. Keep that in mind as you read about my day yesterday, The Shortest Day. As I said in my previous post I was doing this event for the challenge, that challenge being to see how far and how long I could ride for with no real training to speak of. On Saturday I took the advice of my Aspire dietician and had some extra servings of grain and I also added an extra serving of protein. I woke early on Sunday and had a bigish breakfast, not sure if the event was even going to be happening with all the rain that had fallen over night. Driving over to Sumner the sunrise was glorious and I arrived just in time to make a few notes on the points values of a few tracks and head off just after all the others. 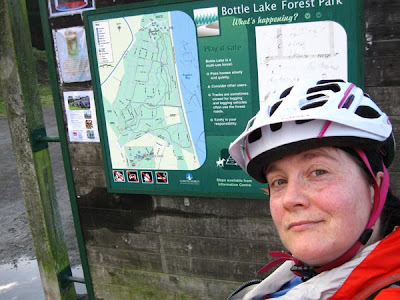 I made some quick calculations about what I thought I could achieve and decided to head to Bottlelake (10pts). It was a nice cruise in the morning sun and I arrived at the sandpit feeling pretty good. I sifted a lap and felt sorry for my poor drive train as there were some extremely muddy bits on the new sections of track. I made sure to keep my intensity under control and didn’t worry when I got passed. All these other riders were out for a Sunday lap of the forest, I had bigger fish to fry. 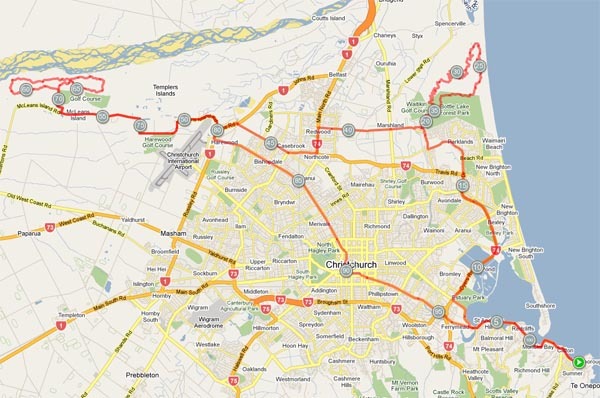 Once I’d finished my lap I had 33kms under my belt and had been going for just over 2 hours. I had some delicious OSM (gah, I hate them) and got back on the road to head to McLean’s Island. Not sure of exactly which roads were the best to take I followed my instincts and made pretty good choices. The rain came down for a while as I cruised along Prestons Rd and soon I reached Main North Rd. Having never been on Prestons Rd before it took me a couple of seconds to orient myself at the intersection, before turning left and heading down to Sawyers Arms Rd. I knew where I was now and headed for Johns Rd (after a brief stop sheltering under someone’s tree to eat more OSM). Soon I was on Johns Rd and my legs were telling me that they were not happy. I found heading out to McLean’s to be a rather painful and unpleasant experience and when I finally got there I headed straight for the tuck shop and grabbed an Ems Power Cookie Bar (om nom nom!). The guy in shop asked if I was doing “that crazy mountain bike marathon” and I said yes. Then he proceeded to tell me how fit and fast the other riders looked. I agreed with him, because all my fellow mad people were indeed skinny whippety sorts (even Slim!). I told him I was representing the overweight, unfit people of the world and he wished me luck. I stopped to have a decent feed of Powercookie Bar, banana, chilli and lime nut bar (OMG, Nice and Natural’s savoury nut bars are the shizzle) and handful of sour snakes before heading out on the big loop. I had entertained thoughts during the week of bringing the roadie on this ride and swapping after McLeans, thank god I didn’t. 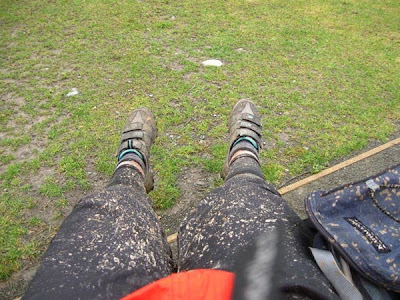 The track was very wet and super muddy and the roadie would have just sunk in it. I cruised along, tucked nicely inside the pain box, riding in that brainless dream you sometimes get into. Many previous laps of this track mean that riding brainless was no problem and I was soon out in the dreaded new back section that I loathe. My legs was really telling me that they were not impressed with the treatment I was giving them and when I got back to the new overbridge I had a wee rest and consumed more snakes. 3kms to go back to the carpark and I grovelled back there, dreading the ride back into town. I got back to the carpark and I’d done almost 75kms in 4hrs and my original plan for the day was fast going out the window. I had been planning on heading to Halswell from here, calling in at home for more drink and dry clothes and then going up Kennedys. 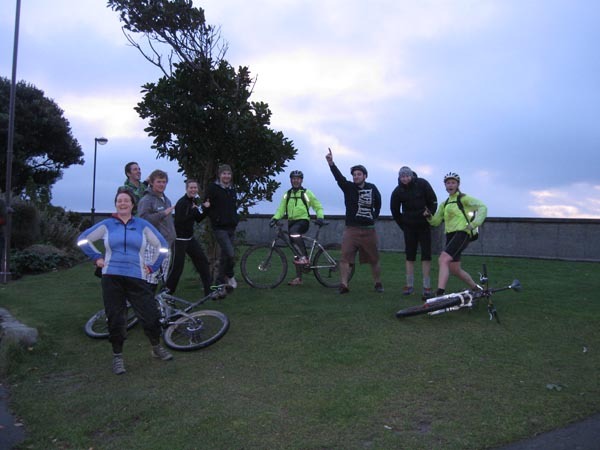 As I lay in the bandstand at McLeans covered in mud I knew there was no way I was going to get up a hill now. I guessed it was 30ish kms back to Sumner and that felt like more than I was capable off. I rang hubby and told him I was going to take the most direct route back to Sumner I could and that I was planning on stopping off at C1 on the way for a decent fed and a long rest. I scoffed down half a Cookie Time cookie and got back on the road. I was very happy to note that heading away from McLeans was much easier and with the calls of monkeys and howls of African dogs ringing in my ears I headed to Harewood Rd. At this point I was really feeling unable to go on. As I passed St James church on the outskirts of town I knew I had to lie down. I pulled into their driveway and saw to my great delight that they had a pew under the veranda of their community centre. Yes! As I lay on that pew with my feet up my mind was completely empty. Even the pain receded as I relaxed. It was bliss. After 10 minutes I felt rejuvenated and got back on my bike and headed into town. The ride into the centre of town seemed to fly by. I think it was the thought of hot foot and a hot chocolate. Soon I was attaching my bike to the bike stands outside C1 with my helmet and perusing their food cabinet. I’d been dreaming about macaroni cheese on my ride into town, but I was thwarted and settled for beef rogan josh with ginger rice, which was even better than mac cheese. 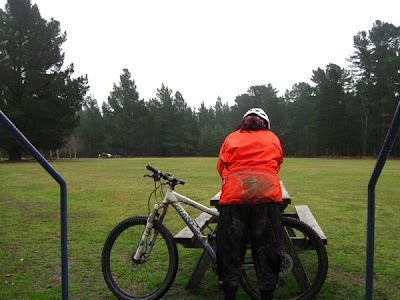 I felt a bit guilty as I slipped my mud covered self in the movie stall seat by the window so I could watch over my not very securely locked bike. 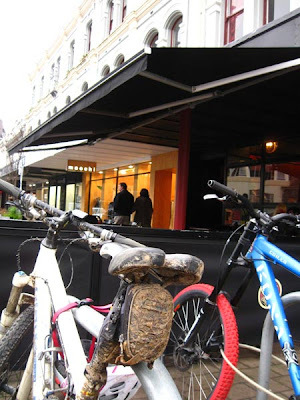 The food was heaven, the warmth was heaven, the hot chocolate was heaven and watching all the trendily dressed hipsters stare at the muddy creature by the window was very amusing. As I sat in the warmth looking at pictures in magazines (I couldn’t read words because I’d lost my brain, even ordering food had been an effort of mammoth proportions) my feet thawed out and the circulation returned and I knew I had just the right amount of time to get back to Sumner for the 4:59pm cutoff. I called into the Mobil on Madras St to grab some sports water as I’d run out of fluids and some Panadol extra to stave off my impending migraine. As I left the shop a nice fella came up to me and asked how my ride was. I said it was pretty good and he asked how far I’d been and when I replied that I’d end up doing over 100kms he was gobsmacked. The look on his face was priceless and it was actually hard to leave because he wanted to ask me loads of questions and he kept wishing me luck. I do rather enjoy smashing people’s preconceptions of someone my size. The grovel back to Sumner was just a mist of pain. At one point Dean Hamilton came barrelling past me with a horribly cheerful wahoo! which urged a little more speed out of the weird white pudding-like substance that was masquerading as my legs. 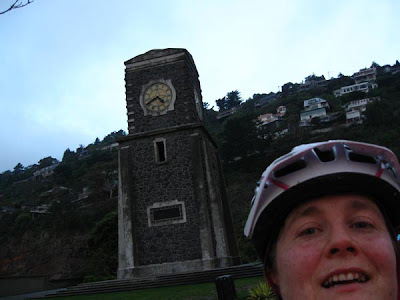 The esplanade in Sumner seemed to stretch on forever and then I was finally at the clock tower. 106kms under my belt with 6hrs 24mins of riding. Sure I hadn’t got anywhere near the hills like all the other loonies doing this ride, but I had achieved more than I thought I could. I had underestimated the distances involved in traversing the city, which was probably a good thing or I might not have even gone out at all, but I had learnt that I have more mental and physical toughness than I knew. I feel like with training I can achieve even more. Being in the painbox for 3.5hrs, with no training, was a great experience. Now I just need to find where I left my brain. Ideas formed in Childhood aren't always correct!